...but at the very least i hope to raise a bit of money and finish within the allocated 2 1/2 hour time limit. i've signed up to do a half-marathon, the Meadows Marathon, in Edinburgh on Sunday, 2/3-2008. those who know me, know that i am not much of a runner... the furthest i've ever run in my whole life is 10 kms, which isn't even half of this distance. so it will be a challenge! but i have running shoes. and it should be physically possible! The Kalash are an isolated group of about 4,000 who live high up in the Hindu Kush mountains on the border between Pakistan and Afghanistan. 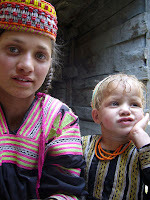 What makes the Kalash particularly special is their religion, which has no parallels anywhere else in Central Asia. The charity is unusual in that it was not set up by westerners, but the Kalash themselves. The objectives are modest, provision of medication through the winter months, when the valleys are snowed in and maintenance of the temples at which the Kalash worship. We also have a special campaign to get the first Kalash lawyer over to the UK to take a high-powered post grad course, which will give him the edge in the pro-bono cases he hopes to fight for his people. The charity has no admin costs so the money you raise will go directly to helping the Kalash. if you want to help raise some money for this worthy cuase, and at the same time make me feel like all this strain pain sweat is worthwhile, please donate! you can do it online here, or get in touch with me. thanks alot! i'll keep you posted on the training... if anyone has any helpful tips, please let me know! The Kalash live in three valleys high in the Hindu Kush Mountains on the border between Pakistan and Afghanistan. They are an anomaly, the last practitioners of an animistic religion which was once followed across much of northern Pakistan and Afghanistan. 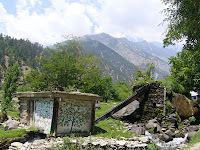 Kipling’s The Man Who Would be King was written about the ancestors of the present day Kalash. The origin of the Kalash religion has been the subject of much speculation. Some academics argue that the Kalash practice an early form of the Vedic religion, which got stuck in the Hindu Kush mountains on its way East to the plains of India. Others argue –less convincingly- that elements of the Kalash’s belief are taken from Greek mythology introduced by errant soldiers from the army of Alexander the Great. Whatever the origins of the Kalash’s unique and endangered religion, there is no doubt that it is extremely ancient. The Kalash People’s Welfare Society was founded by a group of Kalash teachers with the twin aims of preserving Kalash culture and making every day life easier. Towards the preservation of culture funds go to the maintenance of the Kalash’s temples and also to supply animals for the annual cycle of sacrifices which are the most profound manifestation of the Kalash religion. The Kalash lead a though life, especially during the winter months. From November through to April all three valleys are blocked in by heavy snows so any one in serious need of medical attention has to be carried for hours up and over the valley passes before they can receive medication. The charity hopes to be able to provide that Kalash with enough medication to see out each winter. What makes the Kalash People’s Welfare Society special is that it was founded by the Kalash themselves. Most charities in the developing world are set up by foreigners, so the Kalash’s initiative is especially enterprising and unusual. The small size of the charity means that there are no administration costs, so every penny raised goes directly to the Kalash. The women and girls in these photos wear the traditional dress of Kalash ladies, which is very different to that of the women from the surrounding Muslim valleys. Kalash men like men in Pakistan wear long shirts and baggy trousers or shalvar quammez. Some times, though they slip a little flower into the bands of their felt caps to mark that they are Kalash. 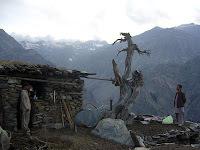 The photo of the shepard’s hut is taken at the high altitude pastures on the Afghan border. Every summer many Kalash men travel up to the high pastures with their goats and sheep, whilst their women stay in the valleys and run things at home. 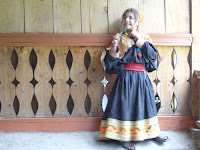 (Kalash society is relatively egalitarian with Kalash women wielding considerable influence within their communities and furthermore reserving the right to divorce their husbands).